When I ordered it they had a bunch of different sizes I could choose from. I am not at home at the moment but if you drop me an email at jonpfl01 at gmail I can get you any info you need. My table is roughly 7 feet by 3.5 feet and it just fits with a few inches to spare so I am guessing it is 6.5 feet by 3 feet. Before they printed for me they sent me a pic to look at so I could check to make sure they didn’t mess up with scaling. Either anniversary or Global was smaller than their size mat by a few inches so they just put a black border. The map is AWESOME. Drop me an email and I can take pics later. The only possible exception I can think of is if Moscow had already fallen and the U.S. or U.K. had liberated Timguska so it wasn’t Russian. Yes, Moscow has fallen BUT that was still Russian territory. So, should Mongolia have Russian troops now or should they still be neutral? 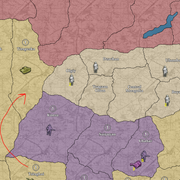 Should this move trigger the Mongolians in ALL situations (except Russia has not attacked Korean or Manchuria)? Looks nice, I have a few questions. How is it holding up? Are the edges stitched? What did it cost? And did the smell go away? 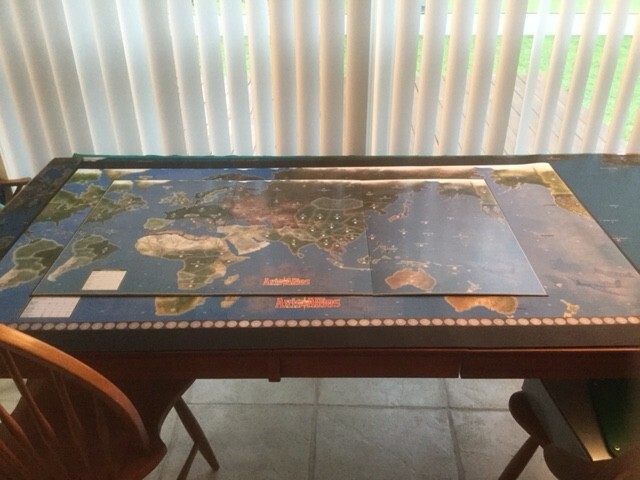 It is holding up great, just played a 5 player 1940 Global this past Sat and it is still set up for when we continue in a few weeks. The edges are not stitched but it was an option. I thought about doing it but decided against it. My anniversary neoprene map had a strong smell so I put it outside a few days and it mostly went away. My global never had smell but I suspect it was older neoprene as it is 2mm and my anniversary is 3mm. If USA attacks Korea from Amur, does that give Japan the ability to attack from Manchuria to Amur without Mongolia turning Russian? Russia is at war with Japan but has not attacked Manchuria or Korea. If it matters, there are American troops in both Amur and Korea. Yes, what is the purpose of them? I bought s custom deck of card for global and was wondering why they have a 1, 2 and 3 card included. I found a company in Hong Kong that does custom neoprene maps. You just upload a hi res image file and within 2 weeks, you have an awesome map. Check out the Anniversary map I just got. The only problem is that it has a strong smell but you just put it outside to air out. OOB map is on top and you can see the Anniversary underneath it (for reference). I do not have anything to do with this company, just wanted to let people know a great way to get a neoprene map!! Thanks for all the suggestions!! I just ordered 50 red monopoly houses for $9.99 on Amazon.